To understand the basic anatomy of a hand plane and to introduce the functions of this versatile tool. What if you were offered a new woodworking tool that was capable of accuracy within a thousandth of an inch? Not only that, while most tools have only one function, this amazing cordless device would handle three important tasks. To understand the basics of preparing a bench plane for use. When you first bring your plane home, the chances are good that it needs to have a few simple steps performed to ensure that it is ready to cut at peak performance. To understand the basics of using a bench plane. When you use a bench plane properly, it is a whole body experience. Using a plane is not hard to master, but does take practice. Planing wood is a whole-body exercise. Whether you are planing a face, an edge, or end grain, the grip, stance and body position are similar. Before you start, lubricate the operation by rubbing a little paraffin wax into the sole. To evaluate which bench planes a woodworker will need to be effective in the workshop. 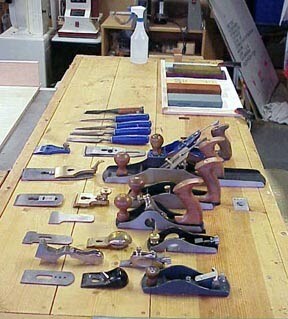 There are many types of bench planes on the market. Which ones does a woodworker need to get the job done? These lengths suit all occasions and can solve almost any furniture-making problem. Make smoothing wood just plane simple. Sand less by tackling tricky wood grains with a scraping plane. Before sandpaper, craftsmen turned to a scraper when they needed a silky smooth surface. Today, scrapers still work wonders for taming wild wood grain, and provide you with a welcome break from the noise and dust of sanding. Unlike hand-held card scrapers, a scraping plane requires less effort, especially on large surfaces, and holds the blade at a consistent angle. I know you talk about planes a lot and I was wondering what planes you would recommend for beginners with a small budget? When it comes to hand planes, the first thing I always recommend to listeners is they should invest in a good, quality block plane. This tool is invaluable whether you’re a power tool junkie or a hand tool user. I prefer a low angle model vs the standard angle, but either will give you pretty much the same results once the blade is sharpened.